The graphics above represent two alternatives for developing the same quantity of software. 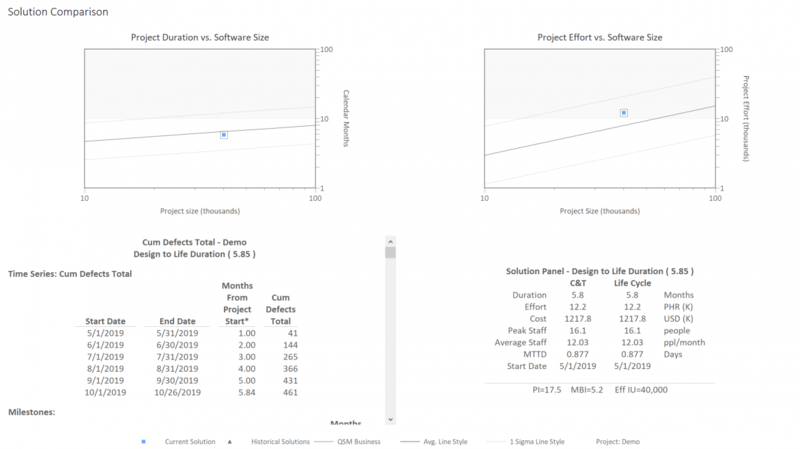 The first solution reflects average industry performance for projects of the given size (i.e., schedule and effort are on the average line). The second demonstrates what occurs when the schedule is reduced by 10% from 6.5 to 5.85 months. In these examples, cost is calculated using a blended labor rate of $100 per hour. Here is a summary of the results. What is particularly notable is that the 5.85-month solution is still fairly close to the average duration and certainly well within the +/- 1 standard deviation lines. It is not an extreme solution (outlier). Yet a mere 10% reduction in schedule increases effort and cost by over 50% and defects by over 25%! Using industry data to show how extremely sensitive cost, quality, and effort are to relatively minor changes in schedule is a powerful tool. The data clearly show how important it is to plan a project’s schedule carefully. This is where what-if modelling with a parametric tool such as SLIM-Estimate can be a real game changer by identifying potential trade-offs beforehand thus allowing the costs and benefits to be properly balanced.